In Pure Silk, Many customers are doubling this yarn by 2, 3, 4, 6 ply as per their requirements. Our machine comes in following type. This machine is electronically controlled. Individual thread passes through electronic sensor and then all threads passes together through electronic cutter. If any thread is broken machine stops immidiately. 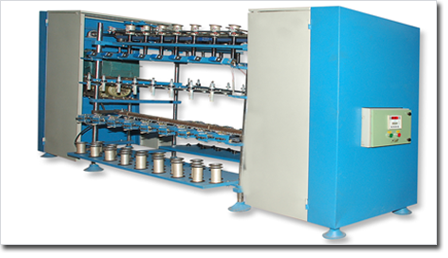 In TFO twister, while doing twisting for 2 or more ply, winding process of bobbins must be done on this machine for smooth performance.